Former Detroit Tigers second baseman Jake Wood never quite hung up his cleats. Now 76, he plays for a Senior Softball team based out of Pensacola, Fla.
Wood had zero idea that one of his former Tigers teammates was also playing Senior Softball until he came across Terry Fox at a tournament in Lafayette, La., around nine years ago. 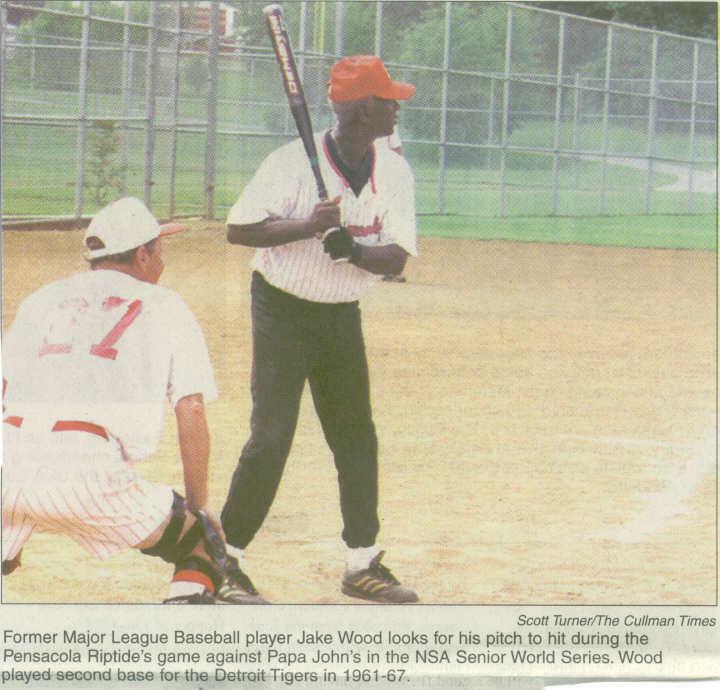 Someone told Wood that he wasn’t the only former baseball player at the tournament; shortly after, the chance encounter happened. 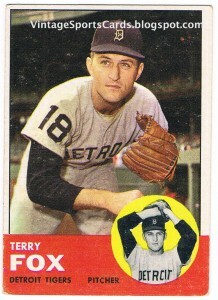 Fox, who is two years older than Wood, spent six seasons with him in Detroit from 1961-66. Save for Fox’s five outings with the Milwaukee Braves in 1960, the guys essentially started their big league careers together in Detroit and quite remarkably more than 50 years later, still grace the same field as each other approximately twice each year. 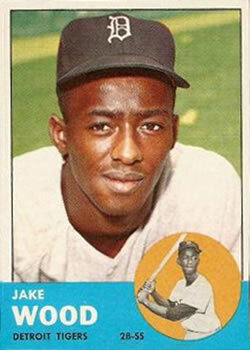 As a 23-year-old from Elizabeth, N.J., Wood made his major league debut for the Tigers in 1961. From his second base position, he remembers watching Roger Maris’ home runs soar over his head during that record-setting season – the year that Maris topped Babe Ruth’s longstanding single-season home run record. In fact, Maris hit eight home runs against the ‘61 Tigers, with all eight landing beyond the right-field fence. The last of those, Maris’ 58th of the season, was a game-winner against Fox that broke a 4-4, 12th-inning tie. That same year, Whitey Ford won 25 games and Mickey Mantle was, well, Mickey Mantle, striking 54 dingers while batting .317. But Wood’s Detroit squad was no slouch, winning 101 games in its own right and boasting phenomenal offensive seasons from Norm Cash, Rocky Colavito and Al Kaline. Meanwhile, the rookie second baseman led the league in triples with 13, stole 30 bases and played in all 162 games. Not everything was rosy for Wood, who struck out a then-record 141 times, but his durability, speed and solid hitting earned him a sixth-place finish in American League Rookie-of-the-Year voting. As a right-handed relief pitcher, Fox notched a team-high 12 saves to go along with a spectacular 1.41 ERA. Excluding Maris’ aforementioned two-run home run, Fox only surrendered seven other earned runs that entire season. Back then, the team with the best record in each league automatically advanced to the World Series. If not for the dominant Yankees (109-53), who ultimately defeated the Cincinnati Reds in five games, Wood, Fox and the Tigers would have had a chance at a championship in 1961. Neither Wood nor Fox would ever win a World Series ring, but the 1968 World Champion Tigers owe a great deal to Mr. Wood. In 1961, Wood became the first African-American hitter developed through the Tigers’ organization to start for the major league team (Jim Proctor pitched two games in 1959). Just three years earlier, Detroit was the second-to-last major league team to integrate, preceding only the Boston Red Sox. Anyway, thanks to Wood’s presence on the team, a promising local kid, 18-year-old slugger Willie Horton, opted to sign with the Tigers as opposed to the Yankees, Orioles or Red Sox, who had all been scouting him for years. And make a path, he did. 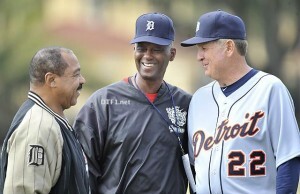 Horton would go on to spend parts of 15 seasons with the Tigers and a total of 18 in the big leagues. During the Tigers’ championship season in ’68, Horton was an All-Star, hit 36 home runs and finished fourth in MVP voting. He also had an excellent World Series, batting .304 and making a key defensive play in Game 5 when the Tigers trailed in the series, 3-1. Horton now serves as Special Assistant to Tigers President/CEO/General Manager Dave Dombrowski. Horton says he was 17 years old when his dad let him skip school to watch Jake Wood man second base. He even remembers the date. It was April 11, 1961. Of course, it wasn’t easy for Wood, who entered the league just 14 years after Jackie Robinson broke major league baseball’s color barrier. After attending integrated schools through high school, Wood was in for a “culture shock” in 1957 when he arrived in Lakeland, Fla., to begin his career. Racial segregation was alive and well in the South. “Racial animosity, it doesn’t just dissolve overnight in 1961,” says Wood. “You would hear certain actions that were taken. I used to ask the guys who were born and raised in the South how they felt about segregation, and the main thing that they responded to was the fact that they didn’t know any different. It was just something that they were taught. So any child, if you teach them to hate this one or that one, hey, that’s the way they grow up; that’s the way they respond.” . On Feb. 4, 2014, Wood and Horton spent the day together in Pensacola, discussing how they could get more inner city kids involved in baseball – kids like former Cardinals outfielder Adron Chambers, whose No. 1 sport growing up was football. The academy they’ll be assisting is the local affiliate for Major League Baseball’s RBI program, short for Reviving Baseball in Inner Cities. 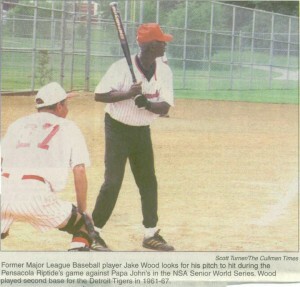 And while he continues to mentor young people in the game (as well as life), Wood still plays second base. His former teammate, Terry Fox, can’t dominate from the pitching rubber – it’s slow-pitch softball – but at 78, he’s going strong as a converted outfielder for a team from New Iberia, La. After retiring from baseball in his early 30s, Wood spent the next 32 years working in operations for Abraham & Strauss, a department store in Brooklyn, N.Y. In 2000, when Wood moved to Pensacola, he took up racquetball in order to stay in shape. To this day, he plays three times each week. With encouragement and support from four of his friends, Wood uses racquetball to work on his flexibility, cardio and endurance. “They run me to death and laugh at me,” he jokes. Although there certainly remains a competitive drive within the former big leaguer, Wood isn’t concerned with dominating. For him, it’s about the big picture.